This inspirational book, following We Are All Born Free, contains 17 quotations about many different aspects of freedom, from the freedom to have an education to that not to be hurt or tortured, the freedom to have a home and the freedom to be yourself. All the chosen quotations are in simple words that can be understood by young children. Authors of the quotations include: Nelson Mandela, Martin Luther King, Harriet Tubman, Anne Frank, the Dalai Lama, Aung San Suu Kyi and Malala Yousafzai. The book is illustrated by internationally acclaimed and award-winning illustrators, including Alexis Deacon, Chris Riddell, Ros Asquith, Jackie Morris and Shirin Adl from the UK, Barroux from France, Roger Mello from Brazil, Birgitta Sif from Iceland, aboriginal artist Sally Morgan from Australia and Mordicai Gerstein from the USA. 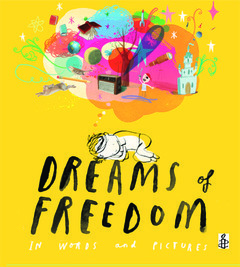 The cover is illustrated by best-selling author/illustrator Oliver Jeffers.